With an increase in focus on urban cultivation and high value crop cultivation, hydroponics is becoming more and more popular especially amongst urban dwellers. Hydroponics is seen as one way to generate a constant supply of fresh vegetables, fruits, condiments and even medicinal herbs throughout the year. From a macro perspective, hydroponics helps localize food systems in cities, where food is typically imported into cities long distances from the countryside or from other countries. From an engineering standpoint, developing an effective hydroponics system necessitates the need to develop several tightly controlled feedback systems that help ensure optimal plant growth. These feedback systems include maintaining optimal plant hydration, light exposure, nutrient delivery, oxygenation levels and temperature. With widespread access to cheap microcontrollers and a plethora of sensors - developing robust hydroponics systems is well within the reach of individuals looking to set up small scale systems. 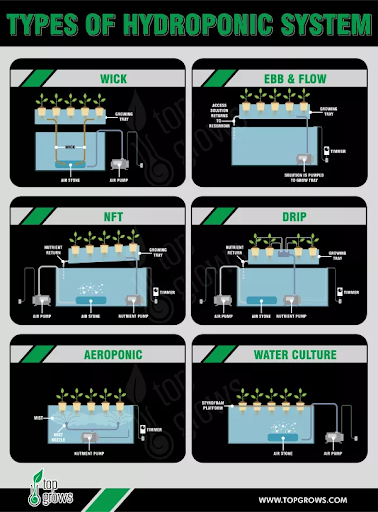 Hydroponics has 6 main techniques: Wick, Water Culture, Ebb & Flow, Nutrient Film Transfer (NFT), Drip, and Aeroponics. The Wick and Water Culture techniques essentially revolve around keeping the plants in constant contact with the growth solution and relying on capillary action and the plant’s roots to take up water and nutrients as needed. These systems are extremely simple to set up, and are the standard choice amongst first time growers. On the other hand, plants in these systems often suffer from poor root oxygenation and root rot due to the being immersed in water all the time. The only control systems needed here involve monitoring the pH levels of the growth solution to ensure that the water quality is well regulated. The NFT technique involves pumping a thin layer of water continuously at the roots of the plants. While these systems promote exceptionally rapid plant growth, they require seedlings to be transplanted into the system. Coupled with higher space and starting costs, NFT systems are extremely popular amongst commercial growers, but less suitable for compact, indoor applications. The Aeroponics, Drip and Ebb & Flow techniques all revolve around periodically wetting plant roots. As compared to the systems discussed above, additional control systems are needed here to monitor the plant’s hydration levels and dynamically adjust the periodicity of the wetting cycles. While the Drip and Ebb & Flow techniques involve pumping water, the Aeroponics technique aerosolizes the plant growth medium and sprays it directly on the plant’s roots. The Aeroponics method is best suited for plants that require low amounts of water whilst the Drip method is best suited for plants that need substantial amounts of water. Among the three, the Ebb & Flow technique has been proven to be the most versatile in promoting growth in a wide variety of plants. Even so, all three systems promote rapid plant growth whilst maintaining a compact footprint - making them suitable for indoor applications. As a whole, from the perspective of developing small scale urban growing solutions, the Ebb & Grow technique offers the optimal of compactness, growth and cost efficacy and versatility. Designing a rudimentary Ebb & Grow system is likely a fairly trivial effort, especially given the widespread availability of cheap microcontrollers and sensors. The real difficulty in developing any hydroponics system, irregardless of scale, comes in tuning the system to achieving optimal growth. Being able to cater for conditions that are often suboptimal or downright hostile requires innovative designs and extensive testing. Even with the challenges that beckon, it’s likely that the popularity of urban hydroponics will continue to increase, especially if current societal trends continue. Beyond urban farming, hydroponics is being heavily investigated by NASA to create closed loop farms that utilize human waste and carbon dioxide to produce food, water and oxygen for astronauts in space. It wasn’t too long ago that electronics were something that only large corporations did - the components and materials necessary to dabble in electronics were simply unaccessible to the average consumer, and the learning curve was steep for a large portion of the machinery. With the advent of Arduino, however, interest in hobby electronics saw a steep rise. Coupled with the push for accessibility, efficient delivery systems, and a focus on consumer satisfaction, electronics were bought to the masses. In the same way that some amateur artists burst into the music scene from humble beginnings, we saw incredible levels of innovation coming from electronic hobbyists with no more marketing than a simple phone video. Electronics became fun to play with and easy to assemble, and as we can see with the so-called useless boxes that only function to turn themselves off, they became more amusing and design-oriented. Rather than simply viewing electronics as a solution-provider, more and more people were using electronics to create simple for the sake of creating. Today, we’re seeing it return to its roots. Hobby electronics have turned serious and more complex - with innovation came more difficult methods and a drop in accessibility due to the rise in the level of complexity. As electronics become more impressive, the creation of such electronics begin to require bigger teams and more funding, thus returning electronics back to its corporate origins. This is a cycle that will likely repeat for some time, and at this time, I believe thar we can look for the creation of new methods that will reduce the learning slope of today’s complex methodologies. We can see computer vision and robotics follow the same cycle; at this time, they have recently become more consumer-accessible. In 2019, and likely for the next few years, we’ll see two things: a rise in machine-vision-focused projects, and a drop in electronic ones. Failure is especially frowned upon in Singapore - in local schools, for instance, failure is seen as the result of a lack of completion, of something not done properly. It places pressure on our students and our workforce, and the negative connotation it has results in unhappiness. In our studio, we operate otherwise - a good design process enables spaces where we look forward to failure constantly, even to the point of designing purposefully for it. Failures define our limits and techniques; it quickly tells us what we should avoid doing in the future, and informs us of the requirements that we may have missed. We see the gaps in our knowledge much faster, and we tighten our specifications much better this way, as opposed to if we’re attempting to circumvent failure entirely. To aim for failure should be a basic goal of every designer. We need to know that not only is it OK to fail, but that we in fact need to allocate space and time in order to look for failure on purpose. We need to design for failure, iteration upon iteration, and learn from what failed in previous iterations. With failure, we become better, humbler, stronger designers, and that makes all the difference. Photograph courtesy of Khoirul Zainal. P.S. : You’re awesome, and we all miss you! Recently, a client came to us with a design which required a unique container to hold liquid. Naturally, it needed to be watertight, but the main challenge was in the materials – glass, acrylic and 3D printed components. 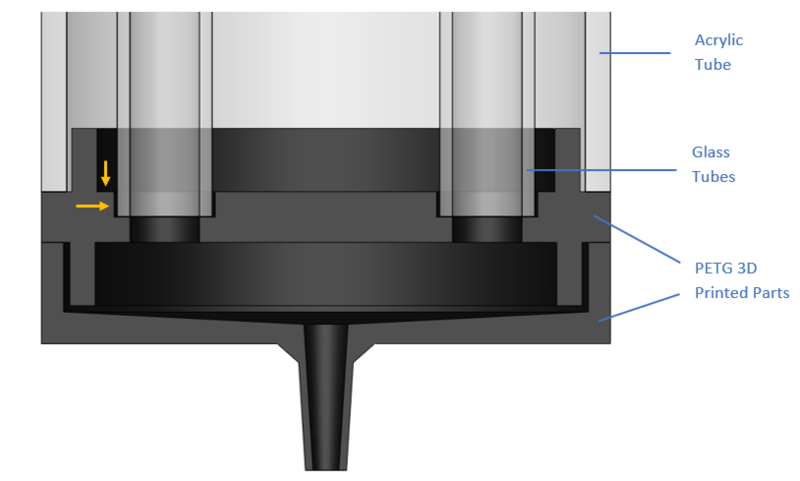 Some quick context on how the container would function: liquid would be poured in from the top, flow through both glass tubes simultaneously and be stored in the base as it waited to be used. When it was completely full, the liquid would fill the glass tubes and half of the top compartment. The clear acrylic casing simply acted as structural support and protection for the glass, and didn’t come in contact with any liquid. The transparency of the materials allowed the user to know when the container was running low by looking at the liquid level in the glass tubes. The complexity of this project was focused on the unique aesthetics the client was trying to achieve. We began with trial and error when designing with food-safe, PETG, 3D-printed parts – testing the hole sizes, spacing, depth and tolerances for the glass piece to fit comfortably and securely. After a few iterations, we began working towards creating a strong, watertight join between the glass and PETG. We chose to apply a Super Clear Sealant to the joining areas that was transparent, food-safe, waterproof, and strong. It was used to fill the gaps in the holes and around, and block anything from escaping through the top (as indicated by yellow arrows in fig. 2). Initial tests showed that the sealant helped to hold the glass tubes in place while we added the outer acrylic tube and provided a watertight seal. This same method was applied to a similar piece on the other end of the acrylic tube, creating an airtight seal in the area surrounding the glass. Unfortunately, we were unable to test the liquid with the expected amount of pressure, as it was not completely assembled at this stage. This eventually led to leakages when the sealant was later tested – because it was silicone based, it didn’t form a strong bond with the glass or the plastic, and so it started to give way under pressure and flood around the glass (see fig. 3 – the dark blue area should not contain water). Another issue later discovered was that when the plastic components themselves were put under the same pressure and left overnight, the liquid would seep out through tiny, random holes in the 3D-printed body. Our first solution was to insert additional 3D-printed parts around the connection point of the glass and plastic, which we sealed around the edges (see yellow indicators), to help stop the liquid from leaking out (see fig. 3). Although we knew this would slightly affect the flow rate, it wouldn’t make too much of an impact and would leave us with a decent, quick solution to our leaking problem. Although it was theoretically a good counter-measure, the additional parts were not 100% effective. After some planning and thought, we decided to drill holes in the acrylic tube that encased our parts (which also provided an air hole to avoid cracking under increased pressure during high-altitude flights) and used a thin tube and syringe to inject resin in to the area surrounding the glass (see fig. 5). We used an Easy Cast clear epoxy resin to get the job done, which took time to test when allowing for the resin to cure but ended up being extremely effective and aesthetically pleasing. To avoid the resin flowing into the plastic parts and clogging, we waited for 5-10 minutes after mixing the resin to allow it to set slightly. This level of viscosity allowed us to fill the desired area and any gaps from our previous attempts, without the worry of filling the plastic chamber below. With this resin method, we can bypass our previous, less successful solutions and speed up the build process of each new container we make. Although the previous attempts were made redundant with the resin, exploring our options was necessary to fully understand the problem and the viability of various solutions. This kind of research and development has made us far more confident in our ability to make these custom containers water tight, and we now have a tested solution that we can implement in future projects should a relevant situation arise. Designing, like a fluid, doesn’t flow in vacuum. Fluid behaves like how it is on earth due to a combination of gravitational force, pressure differences, temperature conditions and the shape of the earth rocks. Likewise, design needs a set of limits and rules to define its universe. Change the rules even a little, and the balance will be thrown off and we might not even live through to tell the difference. If each design is analogized as creating a new universe, gathering the requirements is like defining its law of nature. There is no point in painting planet’s landscape if an added semicolon might wipe off the entire galaxy. I do not start designing until the requirement is set in stone, to emphasize how important the requirements are to a design. My mentor once said, that understanding of the problem is one skill that differentiate good designers and the great ones. In my experience, a problem is unsolvable only because it is not understood properly. A completely deep and thorough understanding is like a fully defined river banks, which enables the design to flow so effortlessly to find the solutions at the end of the process. Gathering the requirement is an art on its own, as the designer usually is not part of the universe that is to be created for the clients and their users. This is where the designer needs to have a far-reaching emphatical heart, paired with observant eyes to gather what would work for the clients and users. This is the core of user-centric design philosophy popularized by IDEO’s Tom Kelley. Personally, I think the understanding of the users should be done even before designing begins. Requirement is also useful to separate the designed universe from the designer’s own preferences and styles, to ensure that the designer can create what is truly best regardless of his/her own personal choices. From this perspective, the act of designing is very similar to that of acting, where one needs to kill his own ego to fully take on the role of a hero, an assassin, a villain or even a demon. A very selfless profession albeit the highlight and glory given to the few celebrated ones.